Boudh District: The Boudh district is separated from Phulbani District which was called Bauda- Phulabani earlier. 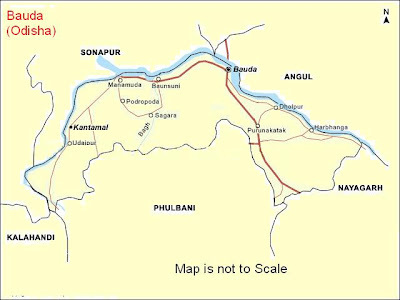 Boudh district having 3444 sq.km area and out of it 1277 sq.km area is forest.Mostly the Southern part of the district is bestowed with dense forest.Boudh having One Boudh Sub-DIvision , Three blocks like Boudh Sadar, Harabhanga and Kantamal. Boudh Town : Amoung other place, we must have to see the Beauty of River Mahanandi , Jogindra Villa Palace, Idol of Buddha Dev Near Palace and Ramnath Temple. Charisambhu: It is famous for Bishnu Temple. Puruna Cuttack: 40 km from Kandhamal is famous for the tepmle of Goddess Vairabi. Padmatola: A wildlife sanctuary of Boudh district. Road- Boudh is 230 km from Bhubaneswar (Via: Khordha, Nayagarh, Dasapalla,) on the route to Sonepur, Balangir. Few Buses in Day and Govt Buses (OSRTC) in Night time are available to reach Boudh.You can also reach via Cuttack, Dhenkanal , Rairakhol by Pvt. Buses.It is also connected from Berhampur via Phulabani and Govt Buses are available in Night time. Rail Head :The nearest railhead is at Rairakhol ( Redhakhol) on the route from Bhubaneswar to Sambalpur. And from Redhakhol it will be 30 KM to reach Boudh through Pvt Buses or rented Vehicles. Another Nearest Railway Station is Balangir which is 90 K.M from Boudh.